A 42 year old Georgian kick-boxing coach based in Tbilisi has broken a Guinness World record that he himself created in December 2011 for having the most spoons stuck on the human body. 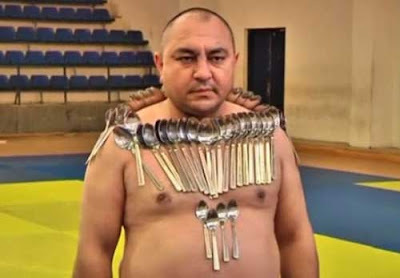 Two years ago, Etibar Elchiyev, called the ‘magnet man’, set the record by sticking 50 spoons on his body. On Saturday he succeeded in sticking 53 metal spoons, thereby breaking his own record. There are doubts as to whether Elchiyev’s body really is magnetic. But Elchiyev maintains that his body acts as a magnet attracting metal objects. Speaking of his plans for the future Elchyev said: "When the time comes I am going (to move) an airplane, then an empty train carriage, something like this, I won't reveal all my cards at once."